Newly opened in December 2013, Hotel Big Mama is located in the heart of the city. The hotel features a terrace, a garden and free WiFi is available. At Hotel Big Mama you can also rent a bike. Hotel Big Mama offers apartments, dormitory and hotel rooms, each of which are decorated in a modern style. All the rooms feature a bathroom and seating area. 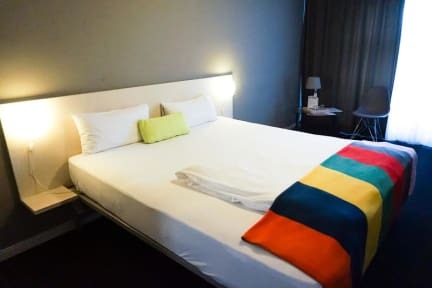 The stylish Hotel Big Mama is situated in the north of Berlin, 600 m from U-Bahn Osloer Straße Underground Station, which offers direct connections to central Berlin in 10-minutes. Berlin-Mitte is one of the most exciting districts with a variety of possibilities such as shopping, dining, sightseeing and a vibrant nightlife. Museum Island is located 5 km from Hotel Big Mama, and the Brandenburg Gate is 6 km away. Gesundbrunnen Train Station is 1.5 km away, and offers direct connections to Berlin Main Train Station within 5-minutes. Schönefeld Airport is a 35-minute drive from Hotel big Mama. Check out from 11:00 to 11:30 . Cancellation policy: 24h before arrival. Payment upon arrival by cash, credit cards, debit cards. This property might pre-authorize your credit card. great hostel, a little bit our of the centre of Berlin but near plenty of public transport. Very clean, good staff. The entrance and breakfast/bar area are top notch, however the dorm is a little on the aged side and very basic. It seems to be good value for Berlin, though it is a little way out on the outer edge of Mitte. A stained mattress and clogged up shower in the barely ventilated small bathroom were made up for by the nice big lockers and speedy helpfulness of the staff. Staff were always super friendly and helpful. I didn't have breakfast as it was an extra 10 euros, but it looked nice. Only there for 1 night due to a bus cancellation. Wouldn’t recommend for solo travelers or for trying to meet people. The bar was super dank though.